There's not much info on Hawthorne aside from this video, which... I said, "THERE'S NOT MUCH INFO ON HAWTHORNE ASIDE FROM THIS VIDEO." See, that was a joke about how obtrusive and unnecessary those captions were. 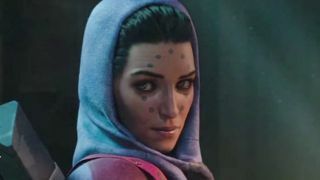 According to Destinypedia, Hawthorne (full name: Suraya Hawthorne) left The Last City as a teenager to find her own way through life. That seems like an incredibly dangerous and bad decision to me, but hey, it means she learned to live without the Light, and she can now teach you and the Vanguard how to do the same. Hawthorne lives on The Farm, Destiny 2's new social space, and her aim with a sniper rifle is as sharp as her sarcastic barbs. The only one who seems able to keep up is Cayde, who points out that, as the old saying goes, those who wear glass ponchos shouldn't throw stones at capes. Or something like that. In any case, I'm just glad to see more characters with personal histories and defined attributes added to the Destiny universe. Some people play Destiny for the loot grind, some for the challenge of Raids, some for PvP; me, I'm just looking forward to an actual story this time around.